For more than six decades, Robert Kyle, M.D., has been on the cutting edge of medical research and technology. But it wasn't until earlier this month that the emeritus Mayo Clinic hematologist dipped a toe into social media. That came in the form of his first "selfie" (taken alongside and posted to Twitter by Vincent Rajkumar, M.D.) during a 90th birthday celebration with friends and colleagues at Mayo Clinic's Rochester campus. It was a different sort of first for a man whose life's work has, colleagues say, helped break new ground in the practice of medicine. Especially for patients at risk of developing myeloma. A profile piece from a few years back in Mayo Clinic research magazine Discovery's Edge notes that Dr. Kyle's "entire career has been directed at helping people with myeloma and related disorders." As a result, the publication reports "today's patients have a much clearer idea of whether or not their condition will progress to myeloma and, if so, at what stage in their life they can expect to develop symptoms." Patients haven't been the only beneficiaries, as Discovery's Edge reports. Dr. Kyle's work has also helped "today's specialists understand that the benign and intermediate forms" of myeloma "are best carefully monitored but left untreated to avoid the potentially debilitating side effects of therapy." Dr. Kyle found time during his career to form the Myeloma, Amyloidosis and Dysproteinemia Group at Mayo Clinic, which Discovery's Edge reports "includes physicians who specialize exclusively in these disorders." And over the years, the research and clinical advances they've made "have led to substantial prolongations" in the life expectancies of their patients. Though he's technically retired, Dr. Kyle continues to work as a supplemental physician in Mayo's Department of Hematology, where he "still gets lots of emails and calls from patients and physicians seeking his expertise," Discovery's Edge reports. And true to form to those who know him, "he responds to all of them and visits with many when they come to the clinic." Dr. Kyle, it seems, wouldn't have it any other way. "Patients are remarkable and having contact with them is very rewarding," he tells the publication. 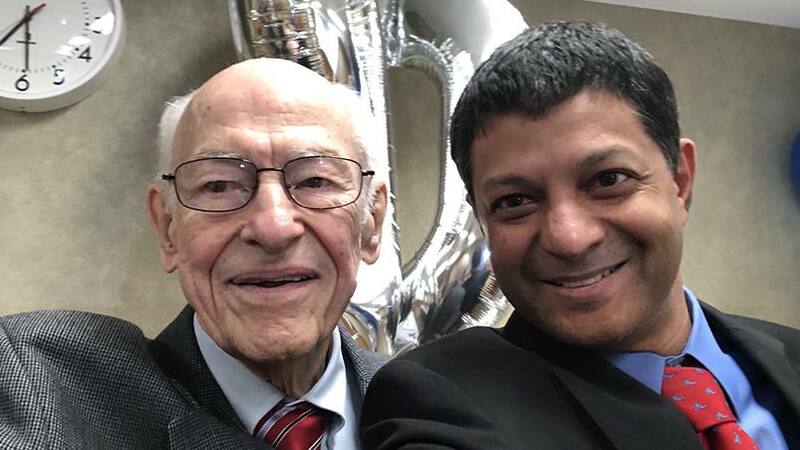 That contact could soon get a boost because in posting Dr. Kyle's first "selfie" to Twitter, Dr. Rajkumar writes that Dr. Kyle himself may soon join the social media site. You can read the rest of Dr. Kyle's story here. Then boost your online presence by sharing your comments below before using the handy social media tools atop this page to share this story with others.